This section of our web site provides answers to the most commonly asked questions about property assessment. You'll find valuable information such as what the department does, why and how property is assessed, and what to do if you have questions about your property assessment. What does the Assessment and Taxation Department do? In simple terms, the Assessment and Taxation Department estimates the market value of city properties - both residential and business - for the purpose of distributing taxes fairly among citizens. The City Assessor has statutory responsibilities to follow provincial legislation and is guided by both the Municipal Assessment Act and City of Winnipeg Charter. Administratively, the Assessment and Taxation Department reports through the Chief Financial Officer to the Chief Administrative Officer and politically to the Standing Committee on Fiscal Issues. What is the Assessment and Taxation Department mailing address? What is the Assessment and Taxation Department web address? Why are Assessment Notices and Tax Bills mailed separately? Assessment Notices and Tax Bills are two separate and distinct items. An Assessment Notice is only issued in a general assessment year or if there is a change in the details on a prior notice (for example: name, description, address, changes to property value, etc.). You will receive your Assessment Notice first, and it is your responsibility to ensure that it reflects market value. If you agree with your assessment, you can simply wait for your tax bill to follow. If you have concerns about your assessment, you should act promptly to have your concerns addressed. What is Assessment and why is it done? Assessment is estimating the value of property for taxation purposes. It provides the basis for taxation in the City, which helps pay for community services, such as policing, fire fighting, garbage collection, and snow removal. What is a general assessment (reassessment)? A general assessment means that new values are established for all properties in the city. Provincial legislation requires the City of Winnipeg to do this every two years using market values as of a specified reference date. How often is a General Assessment done? Provincial legislation requires the City of Winnipeg to do a general assessment every two years using market values as of a specified reference date. The reference date is April 1 of the year two years before the general assessment year. Why does the City conduct regular General Assessments? An assessment is the City's estimate of the value of your property as of a specific date. The City does assessments so it can decide what percentage of its total property tax bill you must pay for your property. Generally, the idea, in its simplest form, is that if you own 1/1,000 of the City's taxable property, you pay 1/1,000 of its property taxes. Why does the City assess properties? The Province's Municipal Assessment Act requires the City to assess all property in Winnipeg so it can fairly and equitably divide the property tax it must raise. The Assessment and Taxation Department's objective is to ensure equity by valuing all similar properties in the same way so each property owner pays a fair share of the property tax. What is the City's assessment base? The Assessment and Taxation Department adds the total assessed value of all the properties in Winnipeg to get its assessment base. The City's taxable assessment base is less because provincial assessment law exempts some properties from paying school and municipal taxes. These exempt properties include most schools and hospitals, educational institutions, places of worship, charities, non-profit daycares, and municipal or religion-owned cemeteries. How does the City assess your property? It is assessed at its market value, or the price your property could normally sell for on the real estate market as of the reference date. The reference date is April 1 of the year two years before the general assessment year. The City assesses the value of both your land and buildings to get a total property assessment. It estimates your property value by studying sales of similar properties and comparing lot size, local improvements, and location, as well as building age, size, quality of construction, and condition. Even if you built it yourself, the City judges your building by the same criteria as other buildings so it can equitably assess all similar buildings. The City takes into account depreciation when calculating your building's assessment. What kinds of improvements increase your assessment? Your assessment will increase if you do extensive renovating, make any structural changes which increase your living space, or build a garage, deck, or swimming pool. It will not increase if you repair a building with similar materials, providing it is not part of a major modernization. Does a valuation staff member have to visit your property to do an assessment? No. The City only employs so many valuation staff members for Winnipeg's 220,000 properties and these staff members visit approximately 10,000 residences a year. Usually, a building is inspected when it is built, renovated, sold, or periodically thereafter. Assessments between these times are based on a property's physical characteristics, which are on file, real estate sales records, and renovations or improvements for which building permits were issued. What is a market value assessment? All properties are assessed at their value. Value means "the amount that the property might reasonably be expected to realize if sold in the open market on the applicable reference date by a willing seller to a willing buyer." Winnipeg's real estate market will change from one reference date to another and consequently values and assessments will change as well. How is the market value assessment of my property determined? The City estimates your property value by studying sales of similar properties and comparing lot size, local improvements, and location, as well as building age, size, quality of construction, and condition. Even if you built it yourself, the City judges your building by the same criteria as other buildings so it can equitably assess all similar buildings. How do I compare my assessment to others in my neighbourhood? The City has public access terminals available at the Assessment and Taxation Department, 457 Main Street. Hours of operation are between 8:30 a.m. and 4:30 p.m., Monday to Friday. These terminals provide duplicate copies of the original assessment notices and tax bills for viewing purposes. Where can I find a book that lists all the houses that have been sold in the City? A copy of the Sales Book can be found on the Sales Books webpage. If the assessed value of my property goes up in a General Assessment year, does that mean that my property taxes will increase? A change in the market value of your property does not necessarily result in a similar proportionate change to your property taxes. What is classification of property? Each class is assigned a percentage; the percentages of assessed value that apply to each class of property determine its portioned value. This portioned value is what is used for taxation purposes. Taxes are calculated using a different percentage of the market value assessment for each classification. For example, taxes for all residential dwellings are based on 45% of their market value assessments. Taxes for some property types are based on as much as 65% of their market value assessments. This is the portion of the assessed value that is used to calculate taxes. It is determined by multiplying the assessed value by the prescribed percentage for your class of property. How do I change the mailing address for my property? What is the annual mailer return date for 2018? May 6, 2019 is return date for the mailers sent on April 11, 2019. My fiscal year ends in April - what do I fill out? We are seeking information for the 12 month period culminating in your most recent year-end. There is a field on the mailer to record the end date for the income and expense information you are providing. What if I cannot return the mailer by the deadline? If you cannot return the mailer by the deadline, inform the Assessment and Taxation Department in writing and include the Property Parcel ID number or Roll number and the address. The Department will be recording requests and responding on a case by case basis. Do I have to mail the Income and Expense Questionnaire information or can I submit the information on-line? You can submit the questionnaires by mail, fax, on-line or drop it off in person at 457 Main Street between 8:30 and 4:30 Monday to Friday. The mailing address is Assessment and Taxation Department, 457 Main Street, Winnipeg MB R3B 1B5. The fax number is 204 986-6105. To submit your information on-line, visit our website at www.winnipegassessment.com. Under "Self Service" click on "My Properties", then click on "Secure Login". At this point, follow the instructions for Creating An Account. What if I have lost my user ID number? Call 311 to complete a service request requesting the information. How do I know you received my submission? Electronic submissions using the online data collection (odc) tool will get a confirmation email. If not submitted electronically, customers can verify on the internet by signing in to odc. If they go to All Properties/My Returns a grid will display all their annual mailers and will show a Mail Received Date. Please remember that mailers deal with the preceding year so that for example mailers submitted in 2012 will be 2011 mailers. Finally, customers can contact 311 and request a verification phone call or email from an Assessor. How can I change or correct information I have already sent in? Contact 311 or contact the Assessment and Taxation Department. You cannot sign in and change the electronic record if you have already submitted it to the City. Why should I submit information? What are Income and Expense Questionnaires and are they available online? The Income and Expense Questionnaire is an annual questionnaire the Assessment Department sends out to gather information on rental income and expenses of properties. The information is used to develop the assessments for most commercial (retail, office, industrial, multi-family) properties. Does it matter if I do not complete and return the Income and Expense Questionnaire? Yes, it matters. The income and expense data is used to develop models for valuation of various commercial properties. If you do not submit this data, the department will have limited information to work with in establishing commercial property values. It will also have less information to verify the accuracy of the value of the individual property in question. Although a property owner can appeal yearly, valuation staff will request that the appeal board apply penalties for noncompliance. These penalties are set out in the Municipal Assessment Act and are outlined on the form itself. How often are these sent out? I just got one a few months ago. In addition to annual income and expense mailers, sales verification forms are sent out for property sales. Sales mailers are sent out periodically during the year to those properties where sales have occurred to request information specific to the sale. Do I just fill out the figures or is there some calculation I should be using when entering the information? You should be able to enter figures directly. Income and expense totals are calculated automatically as individual fields are filled in. Note some fields are intended for monthly data and some are intended for annual data so that this may mean a calculation to match. The important thing is to correctly describe what is being entered - is this gross or net rent? - does this field describe monthly or annual data? Is investment income something that needs to be filled out on these forms as well? No. Only income flowing from the property itself, not from other investments, needs to be reported. What is the penalty? Are there fines? If an appeal applicant has failed to comply, the board or panel can specify in its order that any reduction in the assessed value of the property not take effect until the year following the year to which the application relates. There are no fines. If the property assessment is not appealed, the City does not penalize the customer for not responding to our information request. How can I get a copy of a previous Income & Expense? Request through 311 or email Assessment & Taxation. How can I check what I have submitted? Customers can log in at our website www.winnipegassessment.com under "Self Service" click on "My Properties", then click on "Secure Login" Non-electronic submissions are scanned and attached to the annual mailer record on the Summary page. Request through 311 or email Assessment & Taxation.You cannot sign in and change the electronic record if you have already submitted it to the City. I'm a new owner so I don't have all the information. Please submit what information you can and note why full information is not available. How do I report tenant versus owner occupied property or space? Check off if fully or partly owner occupied. If there is no owner occupied space, these check offs will be left blank and income and expenses reported would normally reflect all the income received and all the expenses incurred for the entire property. What if this property is mixed-part owner occupied and part tenant occupied? These areas can be specified on the Premises tab. Owner occupied space or units can be checked off here as "Owner Occupied". Owner occupied space may or may not report a rent. Please specify whether the income and expense figures reported on the Income and Expense tab represent property totals or just the amount received from the tenant occupied areas. How do I find what my roll number is for my property? Simply visit the Property Search function and search for your property using your address. The search results will show the roll number. In addition, your most recent Assessment Notice or Property Tax Bill will include the roll number of your property. How is the size of my house calculated? The size of your house is calculated based on the dimensions of the building. Exterior measurement of your home and/or plans provided by the builder are used to calculate the size of your house. How is the size of my lot calculated? The size of your lot is determined from registered plans of your subdivision and the Land Titles Office. How are assessments done on vacant land? Assessments for vacant land follow the same approach as properties with houses. A direct sales comparison of vacant land that has sold is used to estimate assessments for vacant property. What is a mill rate and how is it determined? A mill rate is a tax rate expressed as mills per dollar. A mill is one-thousandth of one dollar or one-tenth of one cent. The mill rate is determined by taking the total amount of money that the city needs to collect through property taxes as a fraction of the total portioned assessed value of all properties. For example, if the City needed to collect $53,000,000 and the total portioned assessed value of all properties in the city was $1,785,000,000, it would produce a mill rate of 0.02969 or 29.69. How does the mill rate affect my taxes? For residential properties, municipal taxes are calculated by multiplying the assessed value of your home by the portioning rate (45 percent) to arrive at a value to which the mill rate is applied. Here are examples based on homes with assessed values of $75,000, $100,000, $150,000, and $200,000. How is property assessment used to calculate taxes? Property assessment is merely a distribution mechanism. The value of a property as a fraction of the total assessed value of all property in the city determines its share of the tax burden. How is school tax calculated? This tax is calculated in the same way as property tax, but each school division's mill rate is determined by its budgetary requirements. What is the portioning rate? What determines how much taxes I pay? The portioning rate is the percentage of the assessed value of your property to which taxation is applied. The Province of Manitoba sets this rate. Currently, the portioning rate for residential properties and condominiums is set at 45 percent. What is Annual Rental Value? The Annual Rental Value, or ARV, reflects the typical market rents for commercial space similar to your premise in the reference year or at the reference date. Keep in mind it is not necessarily the rent you paid, but it is representative of the market rents. The ARV is equal to the net rent per square foot as determined by the market, and includes the cost of providing heat and other services necessary for the comfortable use or occupancy of the premises, multiplied by the area or square footage of the premises leased or occupied. The primary source of rents for the reference year or date is the questionnaires mailed to property owners. In addition, rent information published in various reports is considered. What are services necessary for the comfortable use or occupancy? The services necessary for the comfortable use or occupancy of a premise consists of utility costs including heat, hydro, water and air conditioning where applicable. They are determined through a review of actual expenses reported by property owners as well as a review of the public utilities reports. What if I own my premises? If you own your own premises, you will still be assessed for business assessment. The estimated Annual Rental Value (ARV) would be based on the market. In other words, what the market would command for rent if your building was available for lease in the reference year or reference date. What if I am a subtenant? Under Section 319(1) of the City of Winnipeg Charter "Where the occupier of premises sublets all or part of it, an assessor may issue the assessment for the premises, or the part, to the occupier and the subtenant, or either of them." Therefore, if you are a subtenant, it's possible that you may receive a Business Assessment Notice. I received my business assessment notice and I have a taxable party change. What do I need to do? In order for the Assessment and Taxation Department to process a taxable party change or any other change, the busines will have to notify the department in writing with all pertinent information. This includes roll number, premise address, business name, taxable party name, and the date of the change along with what information that needs to be updated. How do I know if my Annual Rental Value is fair? To search and compare other business premises please use the Business Assessment Search. For example, if you are a tenant in a shopping centre and you occupy 2000 square feet in the mall, you would look at other similar retail outlets in the same mall as a comparison to see if your annual rental value is similar to what other tenants are assessed at. Remember, in accordance with the City of Winnipeg Charter, the true test is whether or not your total Annual Rental Value is in general at market and is similar in so far as possible to what other premises have been assessed taking into account size, suitability and advantage of location. Why would I receive a Business Assessment Notice between General Assessments? I believe my business is non-profit in nature, how can I request a business assessment/tax exemption? Simply download the Non-Profit Exemption Form from the Requests for Information page of our website. Alternatively, you can send it by fax to: 204-986-6105. What do I do if I have a concern or a complaint about my assessment? If you miss the appeal deadline, in any given year, you must wait until the next year to file and appeal. A public notice appears in both daily newspapers to remind property owners of this important deadline. For an Assessment Appeal application form or for more information on the appeals process, contact the Board of Revision. What period are my taxes for? The City of Winnipeg tax year is the calendar year and is from January 1st to December 31st. My spouse or another family member has passed away and I need some information about their taxes, can I get this information? Once this information is received a customer service representative will contact the customer directly and provide the required property information. I have power of attorney and I need information regarding a relative's property tax information, can I get this information? I own a numbered company and I require property information, can I get this information? I lost/misplaced a copy of my property and/or business tax bill and I need another copy, can I get one? and one will be mailed to you. *Please note that a copy of the current year tax bill will be provided free of charge until one year past the original mailing date. For copies of previous years tax bills there will be a fee for this service, please refer to the Fee and Services Schedule. I need a receipt for income tax purposes or a receipt to show that my taxes have been paid in full, can I get one? No, the Assessment and Taxation Department does not provide official receipts. Your method of payment is your receipt. However, you may obtain a Statement of Account which will show taxes paid as of December 31st of the tax year. Please refer to the Fee and Services Schedule. 457 Main Street, Winnipeg, MB, R3B 1B5 and one will be mailed to you. I never received a copy of my property and/or business tax bill, can I get a new one? I'm thinking of buying a certain house, how can I get tax information? The City has public access terminals available the Assessment and Taxation Department, 457 Main Street. Hours of operation are between 8:30 a.m. and 4:30 p.m., Monday to Friday. These terminals provide duplicate copies of the original assessment notices and tax bills for viewing purposes. Can I find out how much my neighbours taxes are? Can I find out who owns a certain property? I sold my home during the year. I am completing my income tax return but I need assistance in determining how to report how much property taxes I paid or how much of the Education Property Tax Credit I received. Can you help me? If you bought or sold your home in the year for which you are preparing your annual income taxes, you should contact the Canada Revenue Agency for the property tax reporting rules or the Province of Manitoba's Tax Assistance Office for information concerning the Education Property Tax Credit. I paid my annual property taxes in full for the year but I subsequently sold the house later that same year. How do I receive a refund for the taxes that I paid for the period of time that I did not own the house? The Statement of Adjustment prepared by your lawyer should include the tax payments/credits you are entitled to receive from the purchaser as a result of the sale. The Assessment and Taxation Department is not a party to the private negotiations and transactions between purchaser and vendor in the sale of property. What is the National Business Number (BN9)? The National Business Number (BN9) is a unique, nine-digit number that identifies a business and is assigned by the Canada Revenue Agency (CRA). Each business uses this nine-digit number to identify itself, thus establishing a common business identity across departments and three levels of government. Who assigns the business number? The CRA assigns the business number. A business is assigned a BN9 when they register with a Government of Manitoba BN program (Manitoba Companies Office) or the CRA. A BN9 refers to the nine digits that identify the business owner. When six alphanumeric characters are added, the BN9 becomes a BN15. The six alphanumeric characters are added to identify program accounts. An example of a BN9 with the six alphanumeric characters added would be: 987654321MM0001. The 'MM' portion of the number indicates that the program account is located within a Manitoba Municipality. This is also known as the Municipal Identifier. The four digit number is sequentially assigned by CRA. The first Manitoba Municipality to register the business will receive the "0001" number. Will each of the City's Departments have a different BN15 number? No. For each BN9 there will be a single BN15 with the Municipal Identifier for the City of Winnipeg. A client's BN15 will be the same for all City of Winnipeg departments. Who will be assigning the BN? City of Winnipeg BN15s are automatically assigned to any customer who provides their BN9 and who does not already have a City of Winnipeg BN15 assigned. The system will automatically request the additional six digits from the CRA. What are the benefits of the business number for the client? The business number provides business with a single number that will be recognized by three levels of government - "One Business, One Number." The business number provides the foundation for integrated registration and business self-service using the internet which will be developed at some point in the future. The business number provides a reduction in red tape to process requests for tax assessment, licensing and permit services. It also reduces duplicate information requests from government to business. The business number levels the playing field for business by increasing the identification of business to government. The business number provides will allow for smoother coordinated self-service for businesses. With the business number it will generally be easier to do business with the City because the client can use their unique business number for access to different services. The business number is more efficient for the employee to link information where, without the business number, links had to be done manually or could not be done at all. The business number means changes to business information are up to date (address, phone etc.). The business number will help reduce errors because the business number is self-checking, and errors can be detected easily. Through use of the business number there is the potential for reduced data entry because we can access data from the Province using the business number for reference - there is no ambiguous searching. The business number can help foster better client relationships from more effective and efficient access to information about a business entity. Who has access to the business number? Any employees providing service to a client who has a business number will have access, plus any technical staff required to provide technical support. Staff who have access will be required to observe CRA / Province of Manitoba / City of Winnipeg security requirements for managing the business information. The business number must not be shared or disclosed to anyone other than an authorized representative of the business entity to whom it is assigned. Individual Departments have their own identifying number in their systems. For example the Assessment Taxation Department uses the roll number to primarily identify businesses. Will this now change to the business number as the primary identifier? No. The business number is only an additional field available for searching. The business number does not replace the identifying number each system currently uses. Are there websites with information about the business number? Where can an existing City of Winnipeg client find their business number if they do not know it? City staff can search for a client's business number but questions asked during the search process must only relate to City of Winnipeg accounts held with Assessment, Licensing or Permits. If a business number cannot be located using the City related account information provided by the client, staff should direct the client to contact the CRA. Does every business have a business number? Every Corporation must have a business number as this is the identifier used to file their Corporate Income Tax. Sole Proprietors and Partnerships that have employees, collect and remit GST or PST, import or export in or out of Canada or have registered their name or trade name with the companies office must have a business number. Registered charities that issues donation receipts must have a business number. I am setting up a new business in Winnipeg. Can I register my business, receive my National Business Number, and do all the necessary paperwork at a City office? Not at this point. This is the long range plan but currently a client must register through the Government of Manitoba BN program (Manitoba Companies Office) or the CRA. Are there any privacy issues around the use and disclosure of the business number? Memoranda of Understanding are in place between the City of Winnipeg and the Government of Manitoba as well as between the Government of Manitoba and the CRA. What is the Small Business Tax Credit (SBTC)? The Small Business Tax Credit program has been established by City Council as a way to encourage small business development. Under the SBTC program, businesses with a business assessment (or Annual Rental Value) of $33,900 or less in 2019 will receive an offsetting credit equal to their full business taxes for 2019. How much business taxes will small businesses be eligible to save under the SBTC program? Those businesses with a business assessment of $33,900 or less will be eligible for the SBTC program. The 2019 business tax rate has been set at 4.97%; therefore, qualifying businesses may be eligible to receive a SBTC of up to $1,685.00. How many "small businesses" will benefit from the SBTC program? It is estimated that approximately 5900 businesses (or 48% of all business tax accounts) will receive an offsetting SBTC thereby reducing their current year business taxes to zero. Does the SBTC apply to the Business Improvement Zone (BIZ) Levy? No. Even if a business is eligible to receive the SBTC, if that business is located within the boundary of a Business Improvement Zone, the business will still be required to pay the tax associated with the Business Improvement Zone. Do I need to apply for the SBTC? No, there is no application required for the SBTC. Since the SBTC will be based on the business assessment, the SBTC will be applied automatically once the eligibility criteria is met. How do I get the SBTC? If your business qualifies for the SBTC, the credit will be automatically added to the Annual Statement and Demand for Business Taxes that is scheduled to be mailed in late April. Also, the SBTC will be applied/adjusted throughout the year to reflect ongoing changes in business assessments. The SBTC is not an "open-ended" program. Therefore, a business assessment threshold was required to ensure the SBTC did not exceed the money available to fund the program. I have appealed my business assessment. Will this affect my eligibility for the SBTC? It depends on the final outcome of the appeal. If an appeal increases your business assessment over the ARV threshold, you would become ineligible for the Credit. Conversely, if an appeal decreases your business assessment under the ARV threshold, you would become eligible for the Credit. Any changes to business assessments throughout the year will be reflected in adjustments to the Credit, as required. I have changed the amount of space used for my business. Will this affect my eligibility for the SBTC? Again, this depends on the final outcome of the physical change to your business premise. If increased space results in your business assessment increasing over the ARV threshold, you would become ineligible for the Credit. Conversely, if decreased space results in your business assessment decreasing below the ARV threshold, you would become eligible for the Credit. Any changes to business assessments throughout the year will be reflected in adjustments to the Credit, as required. I did not receive the current years Annual Statement and Demand for Business Taxes because my business has not yet been assessed. Will my business be eligible for the SBTC for the time I was open? Yes. If your business is in operation at anytime in during the year and your business assessment is equal to or less than the ARV threshold, you will be eligible for the SBTC. However, it should be noted that the SBTC will be prorated to reflect part-year business occupancies. I am planning on relocating my business. Will I still be eligible for the SBTC? As long as your business assessment is equal to or less than the ARV threshold, your business would still be eligible for the SBTC even if you moved locations. Can I still appeal my current year business assessment to ensure my business is eligible to receive the SBTC? No. If you have not already filed an appeal of your current year business assessment it is too late as the appeal deadline was in December. I received the SBTC last year and why did not receive the credit this year? Your business would have received the SBTC last year as your ARV was less than the threshold as approved by Council. Therefore if you did not receive the credit your ARV is larger than the threshold approved by Council. I did not receive the SBTC in this year and I had in the past been a T.I.P.P. customer. Do I need to re-enroll? Yes, we do require the business to re-enroll on the T.I.P.P. program as your bank information may have changed since the last time that you were on T.I.P.P.. T.I.P.P. application and information on the T.I.P.P. program. What is a "frontage levy"? Frontage levies can be best described as "special purpose" taxes. Subsection 432(1) of the City of Winnipeg Charter, enables City Council to pass a by-law imposing frontage taxes, which must be charged separately and apart from other taxes on your property. The Charter further outlines how the taxes may be used. Currently, the tax is calculated based on the extent to which a property fronts or abuts a street in which water mains or sewer mains have been placed (i.e. linear frontage measurement). The revenue collected is used for the upgrading, repair, replacement and maintenance of City streets and sidewalks. How is the frontage levy calculated? Frontage levies are calculated in consideration of The Frontage Levy By-law 7958/2002 which sets out the criteria and applicability of the tax. The By-law currently sets out that the tax is applicable to properties that front or abut a street in which water mains or sewer mains have been placed. To start, Council must establish a uniform rate to be applied throughout the city for each frontage tax imposed. Currently, the uniform rates are: (i) $1.40 per frontage foot applicable to all properties fronting on a street in which water mains have been placed, and; (ii) $4.05 per frontage foot applicable to all properties fronting on a street in which sewer mains have been placed. For eligible properties, their linear frontage measurement (linear feet) is multiplied by the combined uniform rate of $5.45 to derive the frontage levy for that property. (b)	Where inequities would result from the application of clause (a) for groups of irregularly-shaped properties, by apportioning the frontage among the properties on an equitable basis. What types of properties are considered irregularly-shaped? The Frontage Levy by-law Subsection 4(a) refers to regularly-shaped properties which are a rectangular or square shaped lot. Subsection 4(b) of the by-law makes reference to irregularly-shaped properties such as, but not limited to, pie-shaped, triangular and wedge shaped lots. How is the frontage determined on an irregularly-shaped property? For irregularly-shaped properties the calculation of the frontage measurement is determined by the use of formulas. This allows for the fair and equitable distribution of frontage for all properties in the City of Winnipeg in accordance with the by-law. If the greater width of the property fronts on the improvement, the assessable frontage is determined by adding the fronting and rear widths and dividing by 2. If the narrower width of the property fronts on the improvement, the assessable frontage is determined by subtracting frontage width from the rear width and dividing by 4. This result is added to the frontage width to determine the frontage. (100’ – 75’) / 4 = 6.25’ + 75’ = 81.25’ is the assessable frontage on this property. On a triangle shaped lot with a depth of less than 120 feet, you determine the assessable frontage by dividing the frontage by 2. 200’ / 2 = 100’ is assessable frontage on this property. 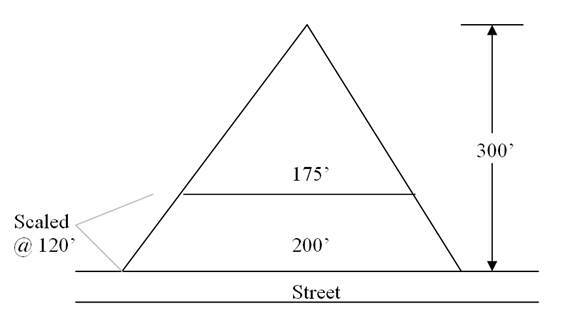 On a triangle shaped lot with a depth of more than 120 feet, the assessable frontage is determined by scaling the property to a maximum of 120 feet for above ground improvements (133 feet for below ground improvements, for example Waste, Water, Sewer). Once scaled to 120 feet, the rear distance is measured and added to the frontage, then divided by 2. Can a property have a different frontage measurement for the sewer measurement and water measurement? Yes, it is possible as it is based on the services installed. I live in a new area and my streets do not need any repairs, why should I pay? The frontage levy revenue is used to repair and maintain the entire City of Winnipeg infrastructure, not just the street that can be seen from your property. I live on an unimproved gravel road and the next street over is paved why should I have to pay the same amount for a frontage levy? The actual amount individual property owners pay in frontage levies is based on a formula which applies a uniform rate against the calculated frontage feet of the property. This current methodology does not take into account the surface type of the street on which a property is located. The revenue generated from the Frontage Levy is dedicated solely for the upgrading, repair, replacement and maintenance of the entire network of streets and sidewalks in the City. As such, revenue collected from the frontage levy is intended to maintain the City-wide infrastructure; not simply the street fronting on the property levied the charge. Do I still have to pay frontage levies if my property does not front on a sewer or water main? If your property fronts on a street that does not contain either a sewer or water main then the frontage levy is not applicable to your property. My property fronts on a sewer and/or water main but I have not connected to the City service, does my property pay a frontage levy? Yes, frontage levies are imposed regardless of whether or not the property is connected with/to the City services or whether or not the property is vacant. My house is on a corner lot and both streets have sewer and water mains does this mean I pay for both sides of my property that fronts on the services? No, for residential properties (except apartment and condominiums) the shorter of the two sides will be used for the calculation of the frontage measurement which is used for the calculation of the levy. I own a commercial property, how is my frontage measurement determined? For commercial properties the calculation of the frontage measurement is determined by any side of the property that fronts on a sewer and/or water main. It is possible for a commercial property to have a frontage measurement calculation using all four sides of the property. Are there residential properties that are subject to having all sides of their property be assessed for the frontage levy? Yes, apartment blocks and condominiums. How is the frontage of condominium unit calculated? The first thing that is done is to determine the measurement of each side of the property that fronts on either or both a sewer and water main. Once this measurement is determined it is multiplied by the common elements of each individual condominium unit. The product of this calculation will be applied against the frontage levy rate to determine the frontage levy for each individual condominium unit. Can I appeal the frontage levy on my property? No, the there is no provision in the City of Winnipeg Charter that allows for the appeal of the frontage levy. How is the frontage levy shown on my property tax bill? The Frontage Levy is listed separately on the Property Tax bill. It is collected in the same manner and due at the same time as Property Taxes noted above. Given the use of Frontage Taxes for street maintenance and repair, the description is "Street Renewal" on the Property Tax Bill. See a sample copy of a Property Tax Bill. A replot is a merge of two or more properties into one or a subdivision of one property into two or more. Example: A condo development is being built on a vacant piece of residential land. When the development is complete a replot will be done to subdivide the piece of land into many individual tax rolls (tax accounts) for taxation purposes. Why does it take so long to assess a new development? There are many factors in assessing or valuing a property this includes the number of developments throughout the City, when the building permits are closed, the number of staff that available to visit the site as well as the City may not have received all the information from the developer. Are there any fees that the Assessment and Taxation Department charges when completing a replot? No, the Assessment and Taxation Department does not add any additional fees to the tax account when completing and valuing the newly merged or subdivided properties. I just received a supplementary tax bill in the mail and I have noticed that there is a replot transaction, is this a fee? No, the Assessment and Taxation Department does not add any additional fees to the tax account. The replot transaction that you see is in fact unpaid property taxes prior to the subdivision or merge of the property. These taxes were billed based on the how the property was prior to the replot and the unpaid taxes are allocated to the new tax accounts based on the starting value of the assessment. How is the replot transaction calculated? The replot transaction amount is calculated based on the outstanding taxes of the tax account prior to the replot and is allocated to the new tax accounts based on the starting value of the assessment. One property with an assessed value of 100,000 and outstanding taxes of $1,300 is being subdivided into two new parcels. In order to properly complete the replot the assessment from the old tax account must equal the total of the assessments of the new tax accounts; this is also true of the outstanding property taxes. There also could be an increase or decrease in assessment in which a supplementary tax bill is issued. Will there always be a replot transaction amount for each new development? It depends if the developer has paid the property taxes on or before the due date. If the developer of the property has paid the taxes in full then there would be no replot transaction; however if the developer has not paid the taxes in full then the remaining taxes would be allocated to the new properties under the replot transaction. For what time period is the replot transaction amount for? If you happen to receive a supplementary tax statement showing a replot transaction this amount is for the full calendar year January 1st to December 31st. If you did not take possession of your property prior to the start of the year your lawyer should have a tax adjustment on your statement of adjustments which is part of the closing procedures when purchasing or selling a property. It appears that I have been taxed twice on the supplementary tax bill, is this true? No, this is not true. If there is a replot transaction it is for unpaid taxes for the original property and allocated based on your assessment of the new property. The tax calculation that you see is based on any value change after the replot has been completed and is only on the incremental change in value. This change in value can be found on the Notice of Change in Assessment document that you have received.